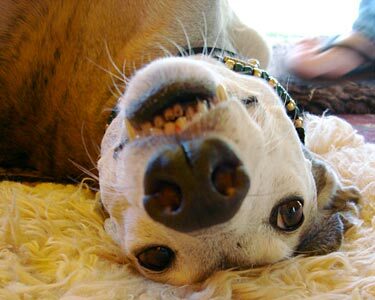 In May 2005, I received a phone call from someone who had found my phone number on the Greyhounds of Fairhaven website. 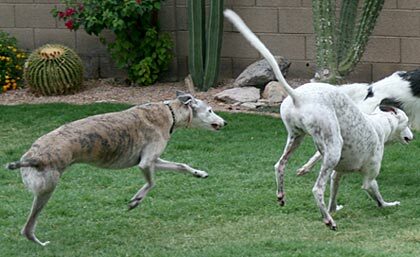 The caller said she knew of a Greyhound whose owners were going to have her put down if someone didn’t take her immediately as she had reportedly bitten one of their children. 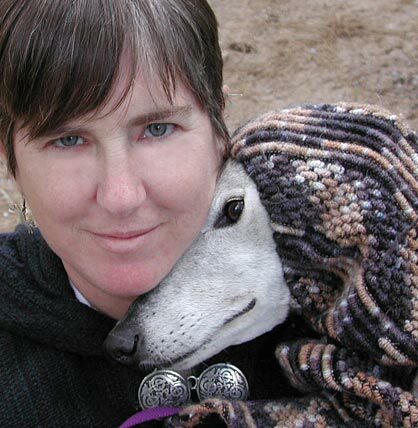 According to the caller, the people had gotten PJ, the Greyhound, from someone who’d had her as a pet for a while, but her former owner didn’t want her back. This person had received PJ from yet a different person or maybe a couple – her history got a bit fuzzy at this point. 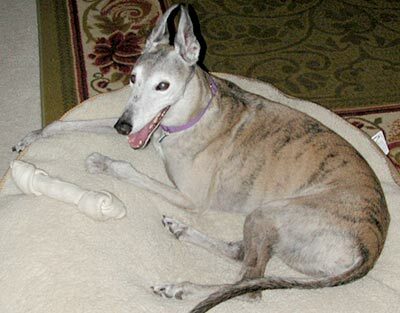 When you adopt a Greyhound from an adoption group, you sign a contract that says you will return the dog to the adoption agency if you ever have to get rid of it, so the agency can find a new home for the dog. 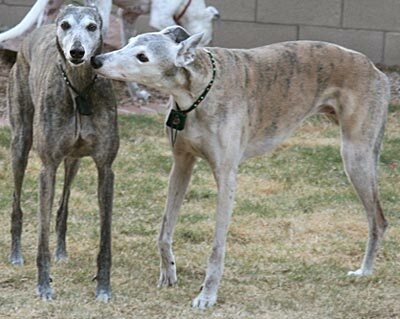 This is done because the agencies want to make sure that Greyhounds go to good homes, ones that are educated about the needs and idiosyncrasies of Greyhounds (prey drive, sensitivity to anesthesia, etc.) 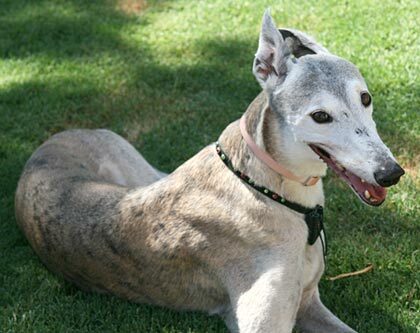 If PJ had originally come from an adoption agency, her original owners had broken their contract by giving her away, and it was likely that she had been in at least two homes (possibly more) that knew nothing about Greyhounds. Greyhounds of Fairhaven is not a rescue group (we promote Greyhound adoption), but I figured I would get PJ out of peril and then get her to an adoption group that could find a home for her. I wouldn’t be able to keep her because we already had four Greyhounds and we didn’t want another dog. 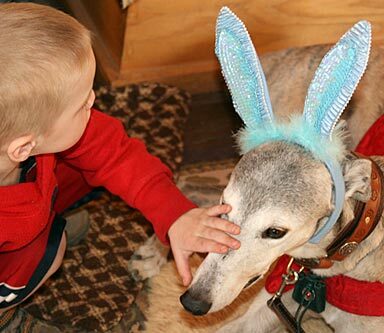 Besides, since we do so much work with the public through Greyhounds of Fairhaven, we couldn’t have a dog that wasn’t good with children. I contacted PJ’s owners and told them I was on my way to pick her up. When I arrived, the poor girl was locked outside in an unlandscaped backyard (just plain dirt – no trees or bushes or grass) in 103-degree heat. 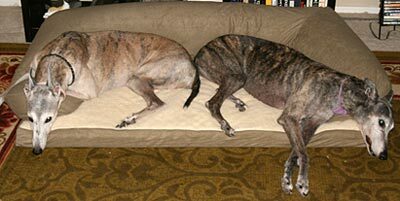 The owners opened the back door and in crept a beautiful, shy, white-faced brindle girl. She let me pet her while I talked to the owners about what had happened between her and the child. PJ had been given to the family by an acquaintance. 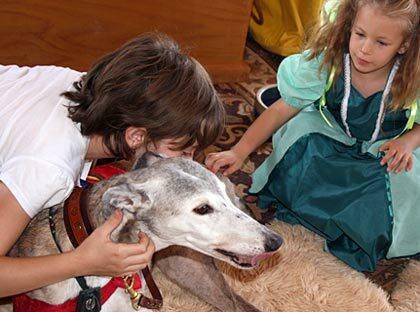 They knew nothing about Greyhounds and, apparently, not much about dogs in general. They thought it was perfectly all right to leave their two young children unsupervised with PJ. One of the children had fallen on her while she was asleep, startling her. She came up snapping and scratched the child’s cheek. Not exactly a “bite” after all. I loaded PJ into my van and headed home. On the way, I had to stop at a friend’s house. 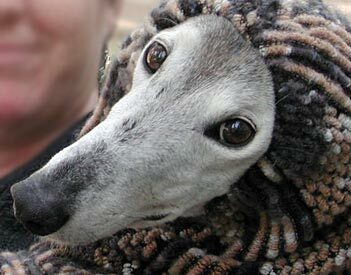 He had several Greyhounds, so I brought PJ in to meet them. She was scared and wouldn’t go anywhere near them. 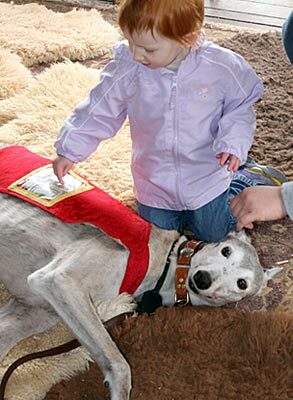 I was not reassured by this reaction – what was she going to do when I got her home to my four Greys? As it turned out, she was scared of them, too, but I took my time and introduced them slowly, and PJ finally relaxed enough to let them check her out. She was still very leery of them, but at least I didn’t need to keep them separated. 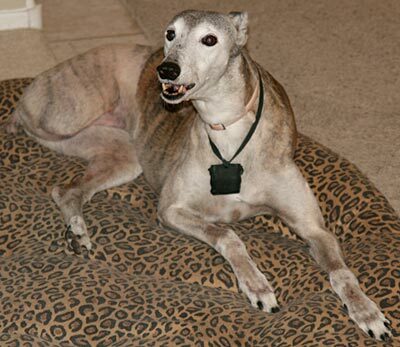 PJ had a microchip tag on her collar, so I called the number on the tag and was told that her chip was registered to Arizona Adopt a Greyhound (AAGI). 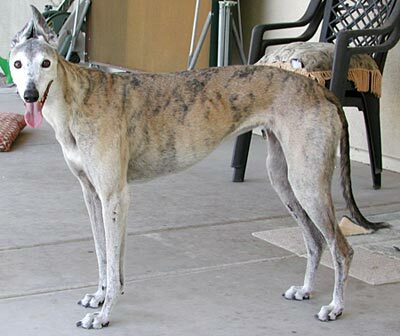 I called AAGI and found out that PJ, whose racing name was PJ’s Jackie Why, had been adopted out in late 1999, just after she’d turned three years old. AAGI hadn’t heard anything about her in the ensuing five-and-a-half years, but they would be happy to take her back and find a good home for her. Unfortunately, they had no foster home openings at the time. Could I keep her for a week or so? “Of course!” says I, secure in the knowledge that this would be a short-term thing since there was no way we could keep such a shy girl. 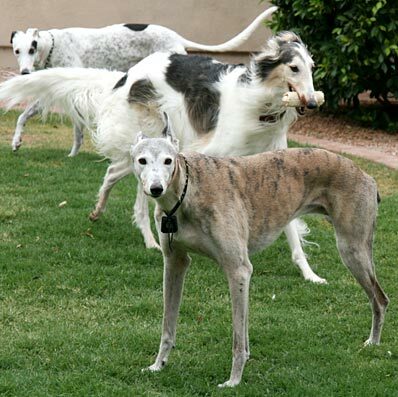 All of our dogs had to be friendly and outgoing, and get along with people and other Greyhounds due to all of our promotional work. And then, three days later, something amazing happened. Shy PJ turned into friendly, loving, outgoing PJ. Not only that, but she displaced BJ, the alpha dog of our pack. BJ happily let PJ have the position; BJ had never really wanted it anyway, having been left top dog when our former alpha, Ebony, died two years earlier. BJ had no trouble being the alpha’s lieutenant, but she’d never been comfortable as the boss. So PJ was no longer afraid of our dogs or shy around us, and (of course) we were falling in love with her. Maybe we could keep her after all. But we still needed to find out if she’d be all right with the public and with other dogs. As luck would have it, my parents were coming to visit, and they would be staying at a campground in the mountains. We decided to take PJ with us when we visited them to see how she reacted with them, their dog, and anyone we met at the campground. 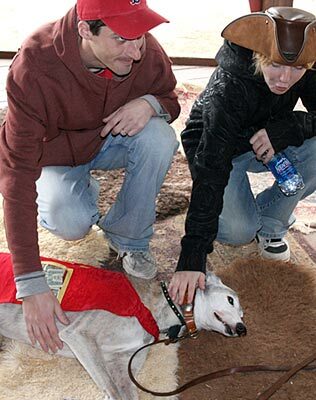 Of course, she did wonderfully – with my parents, with their dog, with all of the strangers she met, even with a couple of Greyhounds that were camping with their people. 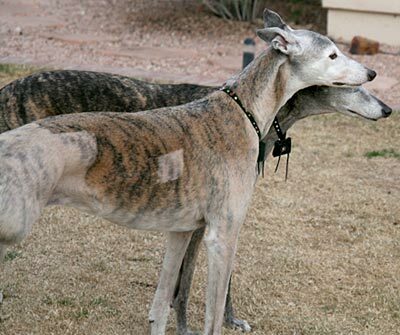 We figure that during whatever happened in the six years between PJ’s initial adoption and the day I picked her up, she forgot she was a Greyhound, and she needed some time with other Greyhounds to remember. 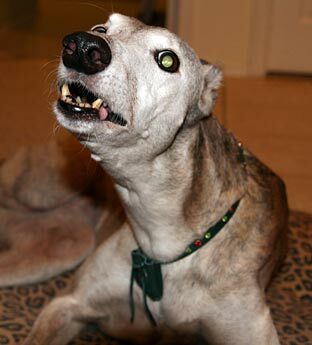 Today, 04 Dec 2008, is Peaches’ twelfth birthday. 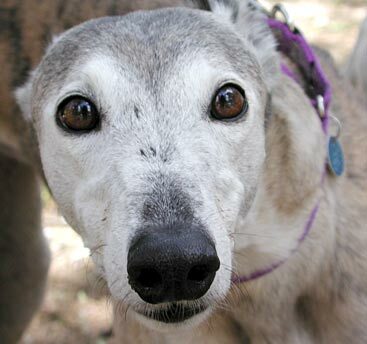 But that’s not the really important thing; after all, there are quite a few twelve year old Greyhounds. What’s really special about Peaches is that last Friday (28 Nov 2008) was her one-year post-amputation anniversary. 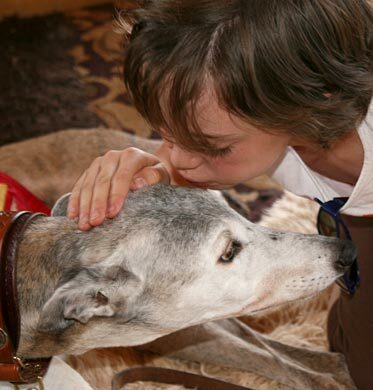 You see, in November 2007, Peaches was diagnosed with osteosarcoma – bone cancer. Osteosarcoma has no real cure; the only way to fight it is to remove the affected limb and, if one chooses, follow the amputation with chemotherapy. 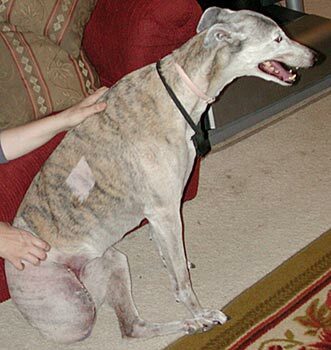 On 28 Nov 2007, Peaches had her rear right leg amputated. 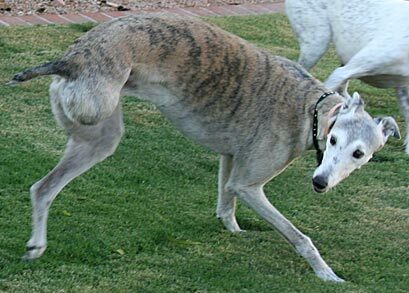 Sometime that night, when the night-duty vet techs were supposed to be watching her, Peaches fell and broke her tail about five inches from the base. No one noticed the break until the techs took her out of her cage the following morning and returned her to the vet. It was a very bad compound fracture and there was no way to save the tail. 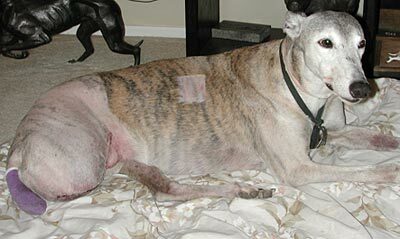 So, on 29 Nov 2007, Peaches had her tail amputated to a five-inch-long stub. Poor girl. A few days later, feeling better. 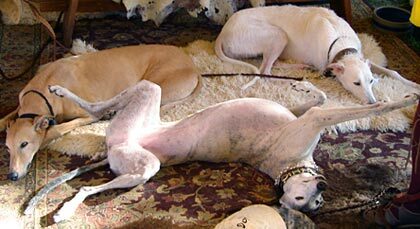 The missing leg and tail also hasn’t interfered with Peaches’ status as the alpha dog of the pack, a position she took back as soon as she got home. 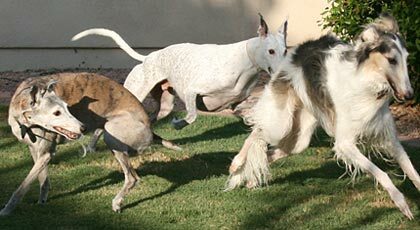 Missing a leg also hasn’t stopped Peaches from having fun with her pack – particularly our two crazy play-boys, Captain Jack Sparrow (white ticked Greyhound) and Sergei (the Borzoi). Happy birthday, Peaches! Here’s to many more years of beating osteosarcoma. 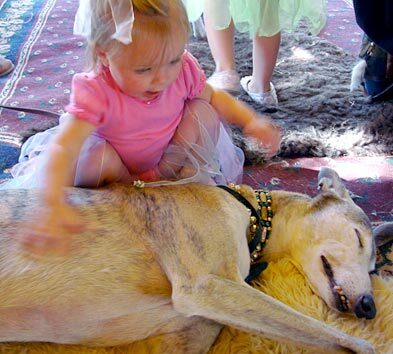 This entry was posted on 4 December 2008 at 10:31 pm and is filed under Birthday, Dog Rescue, Greyhound, Photos, Renaissance faire, Three-legged Greyhound. You can follow any responses to this entry through the RSS 2.0 feed. You can leave a response, or trackback from your own site. Beautiful story,she is so beautiful. I know all about those vicious child biter/eaters, I have one that was preportedly a vicious small dog attacker, with his tongue maybe. He jumps when barked at by an 8 pound maltese. Yup, they are all vicious, their tails a deadly weapon, unless shortened to 5 inches. And everyone knows that a three legged dog is a waste of time, right. Congratulations on having a lovely girl like peaches, and congratulations Peaches on your twelth barkday (woofday to some). Have a wonderful day and get lots of treats from your mom and dad. What a wonderful tribute to one of my favorite hounds! Happy 12th, Peach-dor, the kid-en-ate-her :-). Happy Birthday Peaches, and just as important, happy one year post amp anniversary! Wonderful story! 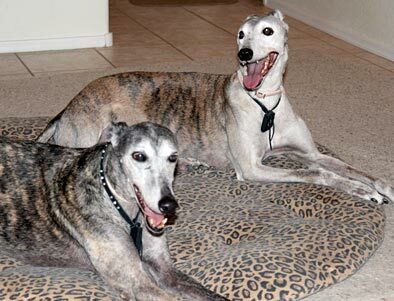 There are so many greyt tales of cherished greyhounds getting forever homes. Happy Birthday Peaches and congratulations on survivorship!! What a great story with a wonderful, happy ending! Happy birthday, Peaches! What a beautiful story. It made me laugh and cry and smile not exactly in that order. Thanks for sharing Peaches’ story! I really enjoyed it. 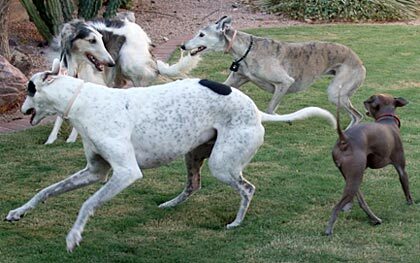 I understand why you feel so lucky, Peaches is one heck of a child-eater greyhound. No children in your neighbourhood to disturb your dinner and such ;o). Gratulerer med dagen, Fersken (that’s what peaches is in Norwegian)! 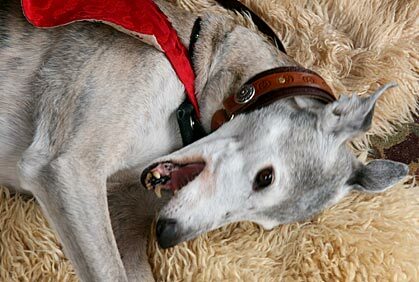 Greyt pictures, they made me good. 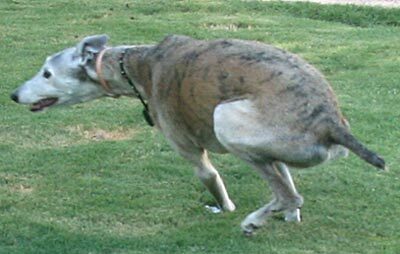 I have been a bit against amputating but the pictures of Peaches running and reading that her tail was the object she “missed”, made me think one more time. What a beautiful, brindle birthday girl.May you have many more much loved birthdays Ms.Peaches.You look stunning for your age.My Copperkettle Gal loved so much like your girl they could have been twins.She was 15 yrs. young when she passed.Seniors melt your heart though.I think they have that planned when they become your family. Mik – Your Peaches is an adorable girl, and I’m so glad to hear she is doing well a year post amp. I have a *Peaches*, too, who is 8 1/2. So happy birthday from my Georgia *Peach* to yours. I love the way you told her story – especially the part about *eating* children :0). It’s amazing the horror stories we sometimes hear about our dogs and how they were before we got them. Could be that they weren’t happy where they were and were just acting out so they could go someplace else! How awesome! 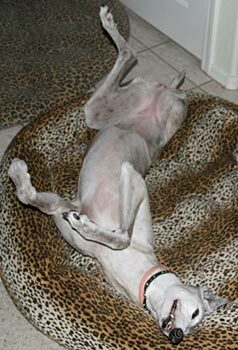 Peaches is just lovely…it’s amazing the ‘staying power’ of greyhounds despite their previous life before you. These dogs face adversity with a tremendous spirit that can’t be fathomed. Thank you for the story of Peaches! 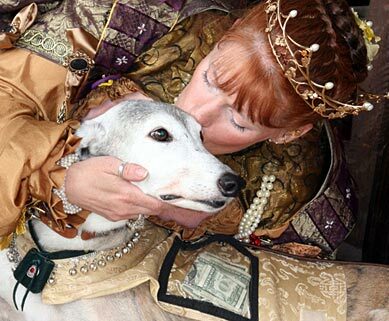 She reminds me of my own faire-dog Lace who would bow to the royalty and totally make them break character! What a fabulous story and wonderful pictures depicting the vicious child muncher. I can only guess that the kids shown in the pictures did not meet Peach’s standard for lunch! 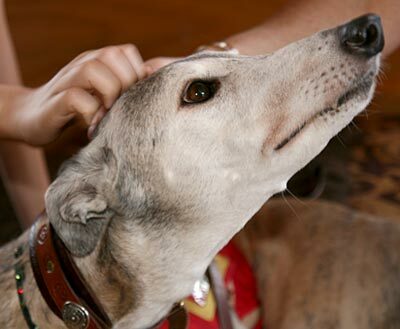 We never know when we will be blessed with the companionship of a greyhound. It is truly a wonderful breed. 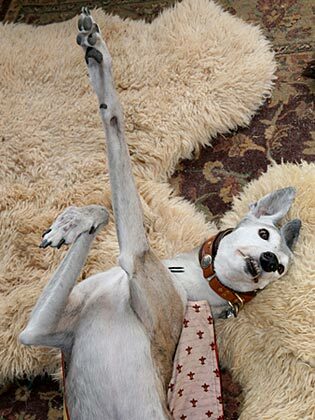 Peaches is a jewel and my greyhound, Beamer, sends her a hearty ROO! Many happy returns, Peaches!!! You’re an inspiration – we lost our girl Sachi to osteo a couple of years ago – it’s great to see an old gal who’s beating it! 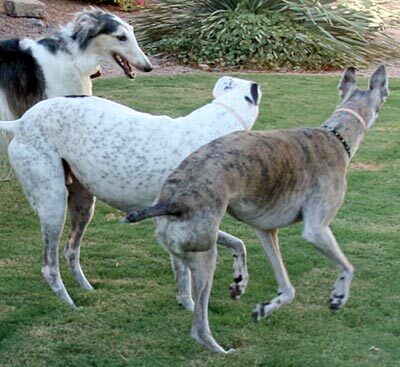 Wags and snoozles from Cosmo and Zuzu – keep romping!
. . . and I like your blog too. Many thoughts I’ve been too timid to voice. 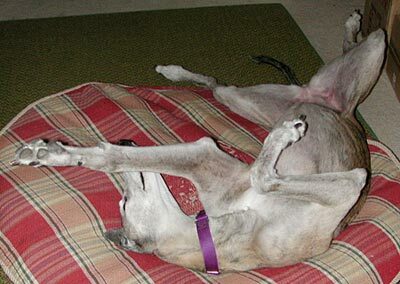 What a GREYT story!! And Peaches does indeed look vicious,LOL… Happy 12th birthday you precious sweet girl, I pray you have many more!! awww, what a great story! Happy Birthday Peaches! My boy Apollo just turned 8 and his sister Sabrina will turn 7 next month. We hope they will live as long and as fully as Peaches has (and I hope will continue to do for years!)! Apollo was a double bounce-back before we got him, very similar story w/r/t the children biting, etc. and I can only say he’s the best boy EVER! He settled right in and is Sabrina’s Lieutenant (I love that term). What a beautiful story. I am so glad that Peaches ended up in your life, with someone to love her as she deserves to be loved. Happy Birthday, Dear Peaches.